Around the world the human family is grieving over the horrific terror attack that killed at least 49 of our Muslim brothers and sisters and wounded dozens more as they worshipped in mosques in Christchurch, New Zealand. We at Multifaith Voices for Peace and Justice share our most heartfelt condolences and sympathy with that community, especially the loved ones of the victims, and offer prayers for what comfort and healing they might find. We also intensify our commitment to stand against all forms of hatred, drawing from the wellspring of love that animates the world’s faith traditions to triumph over bigotry based on race, ethnicity, or religion. Our traditions require our constant vigilance in confronting injustice, intolerance, division, and other evils with a love that we know ultimately wins. New Zealand Prime Minister Jacinda Ardern noted that many of the victims were refugees and immigrants. She proclaimed “New Zealand is their home. They are us.” May we all work and pray for the day when humanity’s shared home, the planet Earth, is so full of love and care for all of God’s children that there is no room left for bigoted and hateful acts of violence. Meanwhile, we stand in solidarity with members of the world-wide Muslim community, offer them our ardent love, and hold their well-being in our hearts. Amidst the rubble of what was once a beautiful mosque in Afghanistan in 2002, a boy was rocking back and forth reciting a portion of the Qur'an. I sat next to him, reminded of how he resembled children in a Jewish synagogue from my childhood, rocking back and forth as they recited Hebrew prayers. The Imam walked over and lightly touched the boy on the shoulder. He stopped praying and looked up. The Imam told the boy that I was Jewish and asked him, "What do we call Jewish people?" The boy smiled at me and responded "People of the Book." "Very good," the Imam replied as he touched his heart. With a nod from the Imam, the boy resumed reciting prayers. Muslims refer to Jews and Christians as people of the book because we share common sacred texts, the Torah, the Bible, and for Muslims, the Qur'an. Today, as people of the book, we grieve with our Muslim siblings and the entire human family over the tragic and horrific killings in New Zealand. Apparently inspired by White Supremacist hate exported from the United States, a killer went on a rampage, killing at least 49 people, as they prayed in mosques on Friday. We must stand up against hate and violence with all of our might and do all that we can to change the hearts of those who harbor such hate, while also doing all that we can to prevent such people from being able to cause such mayhem. May we instead be inspired by the smiles of young children, who instead of harboring hate, see our interconnectedness as a human race. We are not born with hate, we are taught hate. Our task, today, tomorrow and every day is doing all that we can to sow the seeds of love, acceptance, and peace, for what we sow we shall reap, Inshallah. ...your dinner guest makes an Islamophobic comment? ...you witness public instances of racist, anti-Semitic, anti-Muslim, anti-Trans or any other form of oppressive interpersonal violence or harassment? American Friends Service Committee (Quakers) has six thoughtful and helpful tips to counteract anti-Muslim rhetoric in your conversations. They also have bystander intervention do's and don'ts for how to intervene in public situations while considering the safety of everyone involved. Both articles provide guidelines that may be contrary to your first instinct, however noble those may be. These are important reads! The Rev. Dr. William Barber II riveted those gathered at Stanford Memorial Church on January 17, 2019, with a call to not shrink back from the tasks at hand, and to liberate the legacy of Martin Luther King, Jr. so fervently needed in our world today. Did you miss it? Or hunger to hear it again? Click here for six minutes of excerpts from his speech. Rev. 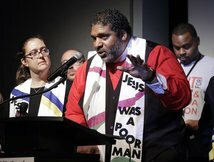 Barber is the founder of the Poor People's Campaign: A National Call for Moral Renewal and Repairers of the Breach. At our October 2018 Peaceful Presence the Rev. Matthew Dutton-Gillett of Trinity Church in Menlo Park led us in this litany. The author, the Rev. Anna Blaedel, Theologian-in-Residence at enfleshed, generously gave us permission to publish it here. May it give us solace, strength and courage for the new year and beyond. Join Faith in Public Life and people of faith and conscience across the nation in signing the PLEDGE TO STAND IN SOLIDARITY WITH PEOPLE SEEKING ASYLUM. As politicians try to divide us against one another according to race, ethnicity, and or nationality, we remain united and steadfast in our conviction that all people deserve dignity, respect, and equity, and that together we can make such a world possible. We are people of faith and conscience, coming from a long tradition of welcoming the sojourner and loving our neighbor and, following the example of our sacred texts, pledge our commitment to be good neighbors to those seeking refuge in our community, and to build a community where all are welcome. Click here to read full statement and sign it. Multifaith Voices for Peace and Justice stands in sadness and solidarity with our Jewish siblings at the news of the tragic shooting at the Tree of Life Congregation in Pittsburgh, PA.
We are all part of the same human family, and the sorrow of one of us is sorrow shared by us all. Our hearts break at such violence and hatred, and we respond by coming together with courageous peace and tenacious love. We grieve the lives lost and dreams broken in Pittsburgh, and extend our prayers to the families and friends of those wounded and killed, to Jews around the world, and especially to our own local Jewish communities. We will stand together, cry together, pray together, and work together to build a world beyond fear and division, a world of compassion, inclusion, justice and peace. Multifaith Voices for Peace & Justice (MVPJ) has set up a process which will allow us to respond quickly with publicly visible acts of solidarity on behalf of any religious, ethnic, or other targeted communities in our local area which are being threatened, or which have been harmed or violated in some way. Examples of triggers could be receipt of hate mail, defacing of property, threats to the well-being of the community or to a member of the community. Our goal is to gather in response and public solidarity within 24-48 hours of learning about the incident. These MVPJ solidarity responses will be faithful, peaceful demonstrations of solidarity and friendship, and do not require the training necessary for the Rapid Response teams who will be possibly confronting ICE agents or raids. Supportive, peaceful, faith-based signs may be brought by participants to these public solidarity events. When an action is needed, our email subject title will be “IMMEDIATE LOCAL RESPONSE NEEDED”, and the body of the email will include instructions as to where and when to gather. If your community is targeted or threatened in some way, and you want to ask for a public show of solidarity, or simply discuss this possibility, please contact us through this email: solidarity@multifaithpeace.org. You may certainly talk with anyone on the MVPJ steering committee personally if you prefer, however the "solidarity@multifaithpeace.org" email is set up to be checked several times every day, for a quick response. If your community is required to evacuate its premises due to an emergency such as a bomb threat or threatening graffiti and needs an alternate space for worship or study on short notice, we have several congregations who are willing to host you if at all possible. You may inquire about this offer through solidarity@multifaithpeace.org and we will help you connect to these communities as quickly as possible. In all actions that it takes, members of Multifaith Voices for Peace and Justice commit to the principles of non-violence, and pledge that all their actions will be peaceful, respectful, prayerful and non-violent. 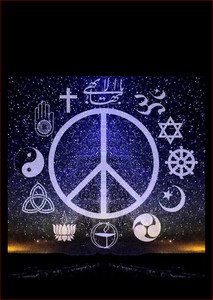 In the midst of difficult times, Multifaith Voices for Peace and Justice will host “Peaceful Presence,” a monthly prayer service on the evening of the 11th of each month, offering a time of quiet multifaith prayers for peace and strength for the journey. All are welcome: those of all faith traditions and of no defined faith, those who are suffering at the hands of their own government, those who need a pause in the midst of intensive work on behalf of others, and all who would like to pray with others for the well-being of all. The prayer time will include elements from several religious traditions. California Assembly Joint Resolution 33 (AJR 33) calls on our federal government and our nation to make nuclear disarmament the centerpiece of our national security policy by embracing the United Nations Treaty on the Prohibition of Nuclear Weapons. Update: AJR 33 PASSED ON AUGUST 28! Thank you for your work in supporting this step toward nuclear disarmament! Click here to read the press release with more information from the Nuclear Age Peace Foundation.